Deacon Craig R Bryce toasting the People of Scotland. 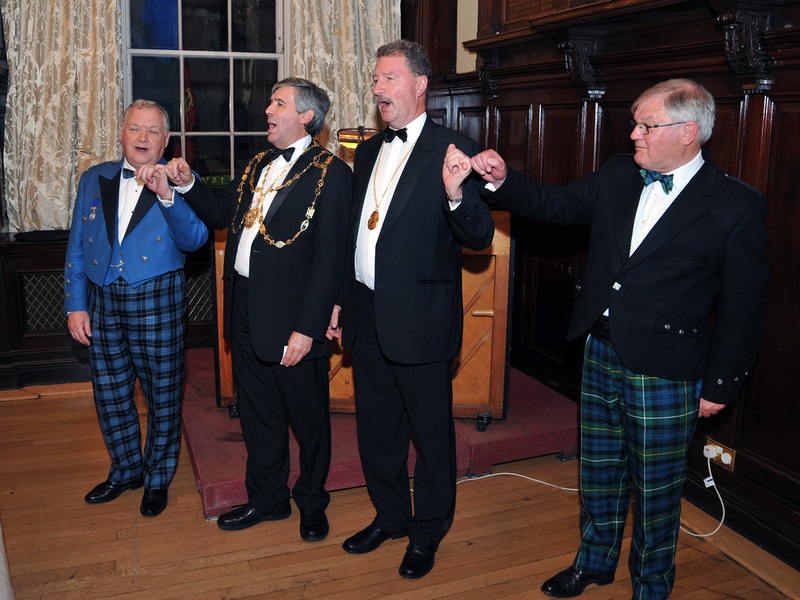 The Deacon's Choosing Dinner took place on the day of the Scottish Referendum which was also the year of the Haggis; the year that the Commonwealth Games came to Glasgow, the year that the nation commemorated the commencement of the First World War and the year that the Ryder Cup came to Scotland. All of these events have a lasting legacy, none more so than the Referendum. During his introductory remarks, the Deacon asked everyone to join him in a toast to the people of Scotland, no matter which political party they supported nor which way they voted on during the Referendum. 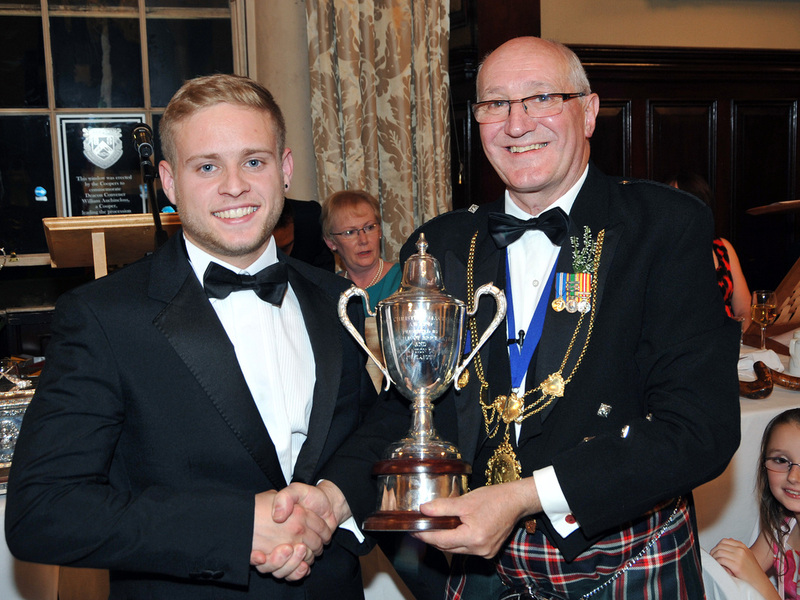 Anyone wishing to see more photographs of the evening should click here. 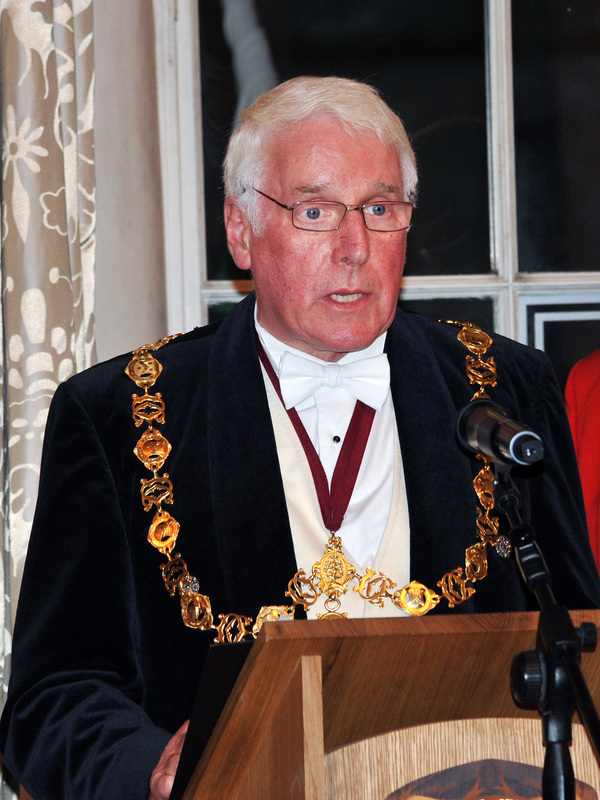 Colin Tennant Toasting the Incorporation of Masons. 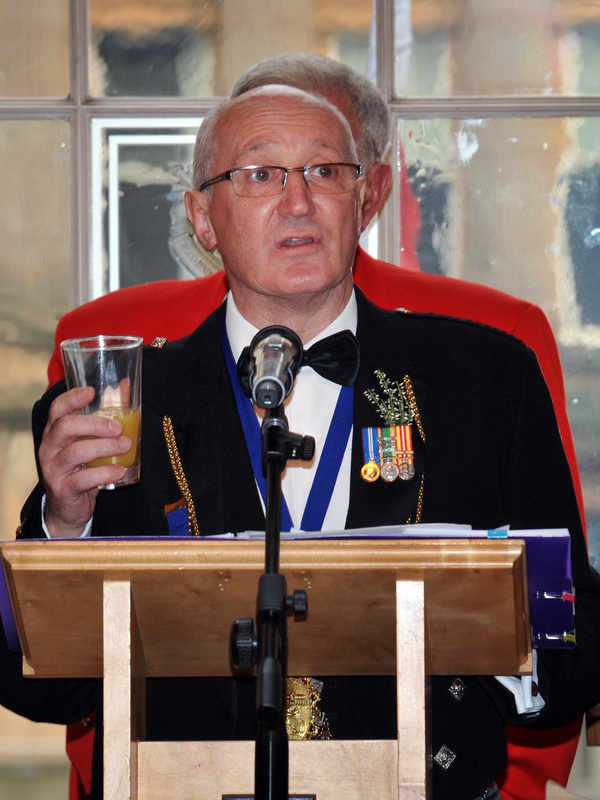 The first toast to be proposed in the evening was by Colin Tennant of Historic Scotland. Colin outlined the work of Historic Scotland and how he wished to see a closer liaison with the Incorporation. At the end of his speech, Colin offered to give the members of the Incorporation a tour of Glasgow Cathedral when the scaffolding has been put up again. At the end of the Toast, Colin led the dinner guests in the singing of "The Incorporation of Masons"
Past Deacon Convenor David Dobson replying to the toast to the Masons. O, oor wee Craft’s, the best wee craft. It shines out like a beacon. 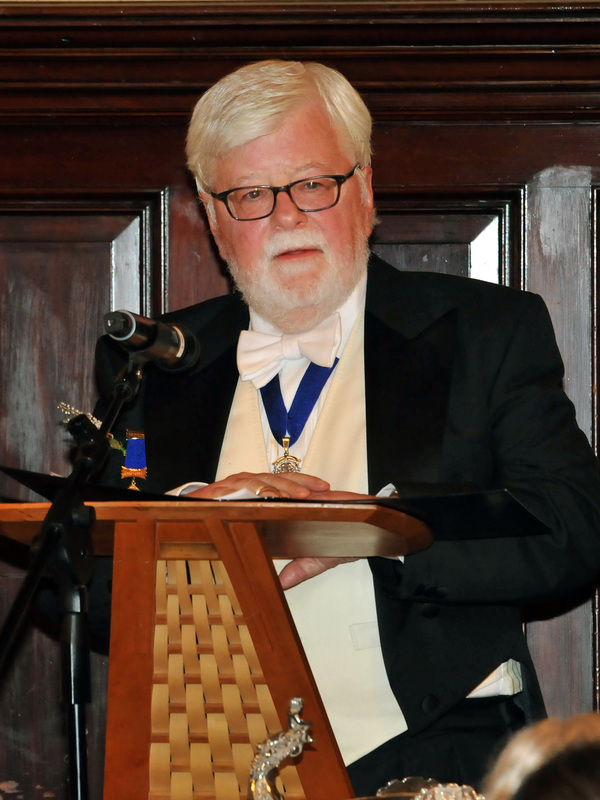 David outlined how he believed that the masons were the best craft by comparing the different aspects of other crafts' dinners compared to the more sophisticated and sociable aspects of the Masons' Dinner. As always, David's speech was met with great merriment and appreciation. Ross came to City of Glasgow College as a fresh faced lad just out of school. During his learning experience in college Ross has matured as a person and worker in which he was a pleasure to teach and interact. Ross has shown a flair for being punctual and utilising his initiative which are skills sought within the construction industry. Ross has the ability to build on his vocational skills to which he will be an asset within in any stonemasonry contractor. Deacon Craig R Bryce with Lady McDonald Winner David Gilmour. David Gilmour currently works as a construction manager at Lend Lease. David has had an interesting route into construction that has seen him start at the very bottom on a pre-apprenticeship course at South Lanarkshire College. Having secured a roof slating and tiling apprenticeship as a result of his hard work and commitment, David found a trade in which he excelled. David has won numerous awards for his work within the construction industry, has recently completed a Masters degree at Caledonian University and is now pursuing a PhD. He was responsible for managing construction works at Hampden for the Commonwealth games. Andrew followed his brother steps into stonemasonry in which he has conducted himself as a gentleman and Scholar. Andrew has a shown a determination to complete his studies even through a change in company. Andrew has the ability and the desire to enter the management field within construction. He has the communication and people skills to create a bright and interesting future within construction. Andrew is at present a second year Stonemasonry student at City of Glasgow College. 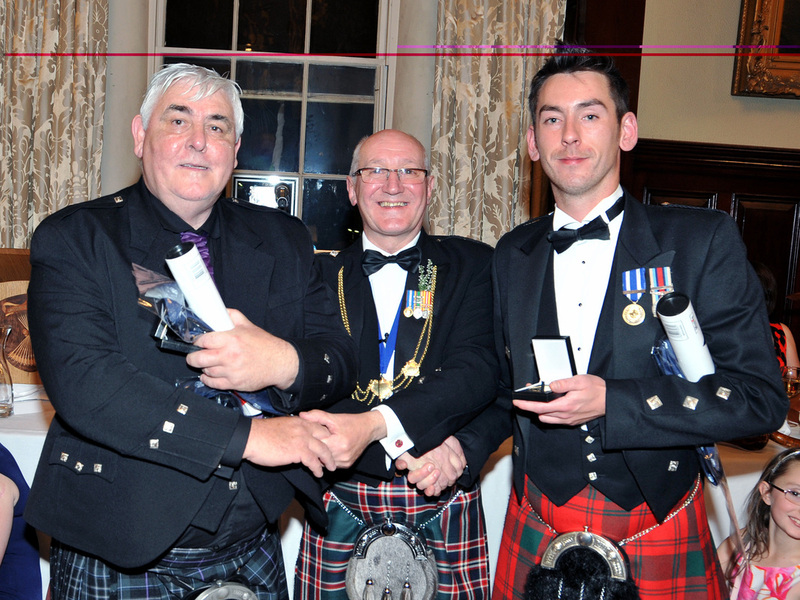 Andrew's award was sponsored by Historic Scotland. 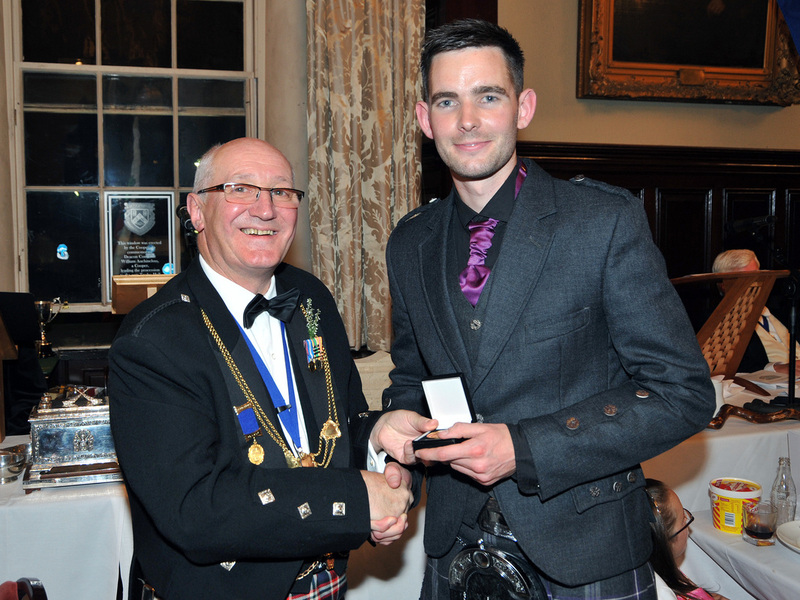 James Arnold has been an outstanding stonemasonry over the last two years, winning numerous awards and representing the City of Glasgow College at a number of regional and national competitions. James has also served his country in the British Army where he completed a tour of Afghanistan before leaving to pursue his dream of a career in the construction industry. James has recently embarked on his advanced craft training at College and is looking forward to becoming a tradesman in October 2014. James’ lecturer Mark Cameron stated that James was an absolute credit to himself, to his employer and to the College. John Weir is a time served Bricklayer who served five years of an indentured apprenticeship. He enjoyed a varied and comprehensive apprenticeship including both domestic and commercial buildings but it was conservation and restoration works that really captured his imagination. After working with several firms and spending a period as a self employed bricklayer, John started with Jewel & Esk Valley College as a trainer assessor. He progressed onto lecturing and providing on-site assessment and training to help unqualified Bricklayers formalise their workplace experiences. He has continued his commitment to personal development over the last few years having engaged in a post graduate qualification in Conservation and a NEBOSH health and safety qualification. John is now the course leader for the NPA Brickwork programme at the City of Glasgow College. Sadly Ousman was unable to attend the evening, but the following is an outline of his attributes. Ousman is employed by JQ Tiling services in Edinburgh, he has only just completed his first year as an apprentice wall and floor tiler and has already made an impact, in April of this year Ousman came first place at the Skill Build regional final and will be representing himself, his employer and the City of Glasgow College at this year’s Skills show at the Birmingham NEC in November. Ousman has already shown great commitment to extending his skills by putting in extra hours of training. As well as holding down an apprenticeship and carving a career in the construction industry Ousman is also a successful footballer, he has just recently signed for Selkirk Juniors and is already a familiar name on the score sheet. 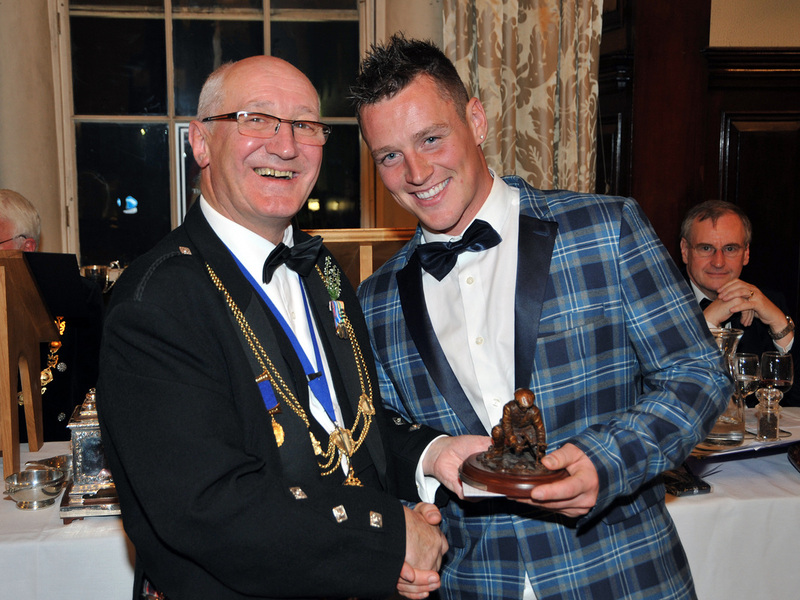 Robert Young Guild of Bricklayers Senior Trophy winner and Deacon Craig R Bryce. Robert Young identified early in his career that he had a keen interest in becoming a bricklayer and pursued his goal on NPA bricklaying courses at John Wheatly and City of Glasgow Colleges. After impressing the interview panel at a two-stage trial with CCG he was offered an apprenticeship. 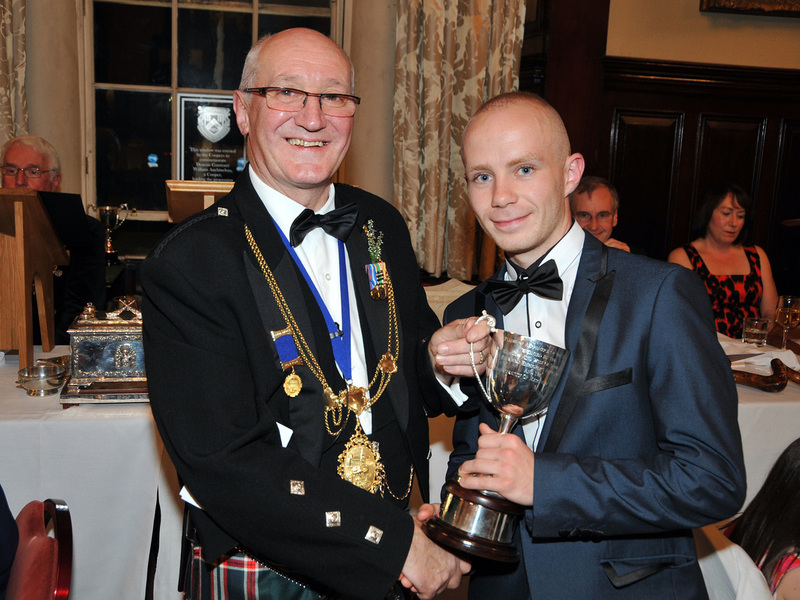 Although Robert initially found the course challenging he was awarded the most improved and best apprentice in the class during his first year at South Lanarkshire College. 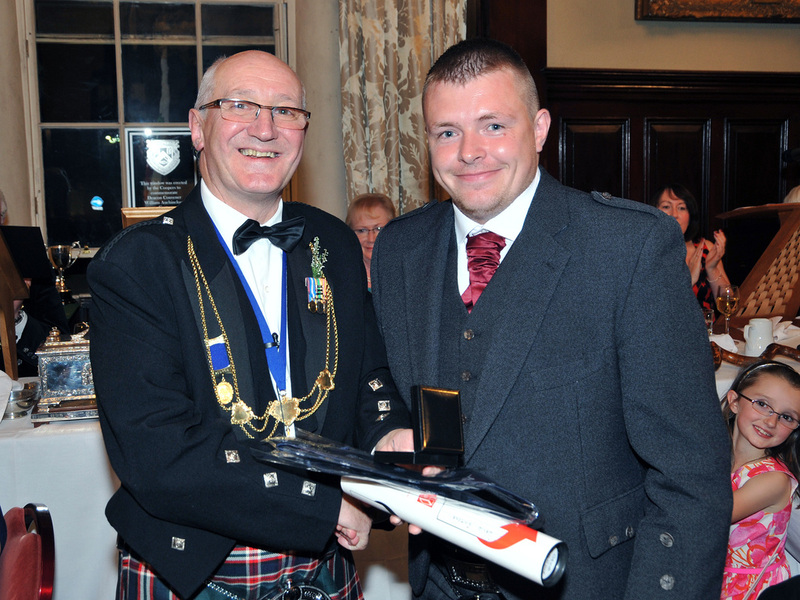 He was also awarded the 3rd prize Anderson site phase 2 award by CCG for his outstanding efforts in the workplace. Robert has since been awarded the 2nd year bricklaying of excellence award and 1st prize Anderson phase 3 award, has won gold at the annual Skillbuild regional heats and has been nominated for modern apprentice of the year, Robert is currently in his fourth year and aims to move into site management after spending a year in Australia. 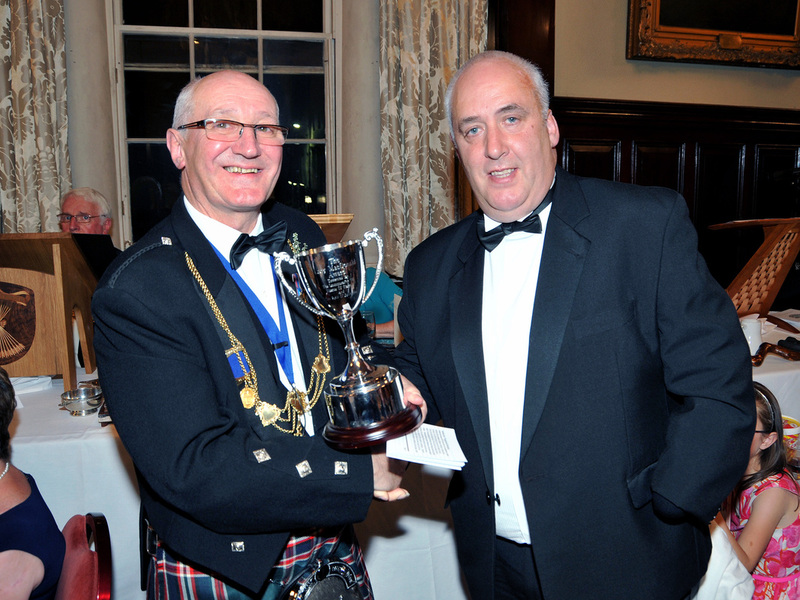 Deacon Craig R Bryce and Mr Ian Ferguson father of Ian Ferguson winner of Guild of Bricklayers Junior Quaich. Unfortunately Ian was working in London and his father represented him at the Dinner. Ian Ferguson is a 2nd year apprentice with Stuart McIttrich Builders in Cambuslang. He gained his apprenticeship after a competitive six week trial having attended a pre-vocational bricklaying course at Kelvin College. Ian has been invited tonight after his excellent performance in the annual Skillbuild Regional heats at the City of Glasgow College. Ian is currently working in London so cannot be here tonight but is represented on the night by his very proud mother and father. Unfortunately Andrew was unable to be present at the Dinner. Andrew Airns was a HGV driver with a lot of experience, before deciding that he needed a change of direction. Andrew then enrolled on the NPA bricklaying course with brilliant results. During the time Andrew was on the course he showed natural ability in the bricklaying with the end result being producing great models. Andrew also was a good influence on the other student by taking time and showing them particular traits that he was good at which helped the other student’s confidence. Andrew’s enthusiasm and attitude helped the other student with their motivation due to the dire weather conditions at the project, when City of Glasgow College undertook a community project at Townhead Community Centre. Andrew also showed his talents for bricklaying when he won the competition against South Lanarkshire College last June. Deacon Craig R Bryce and Gary Bagan, Marley Trophy winner. Gary Bagan is a second year apprentice with Paul Miller Slaters and Plasterers where after a brief trial period as a labourer he was offered the opportunity to pursue an apprenticeship in roof slating and tiling. He has achieved a great deal whilst training at South Lanarkshire College and was awarded both the apprentice of the year in 2014 and given the opportunity to compete against the best apprentices in Britain in the annual Skillbuild Competition. Gary is a committed young man who is already looking to the future as he has enrolled on an HNC in Construction Management. He is also the star centre half for amateur football side Cadzow Welfare and is looking forward to getting married next year. Deacon Craig R Bryce and Jamie Acheson winner of Plastering prize. 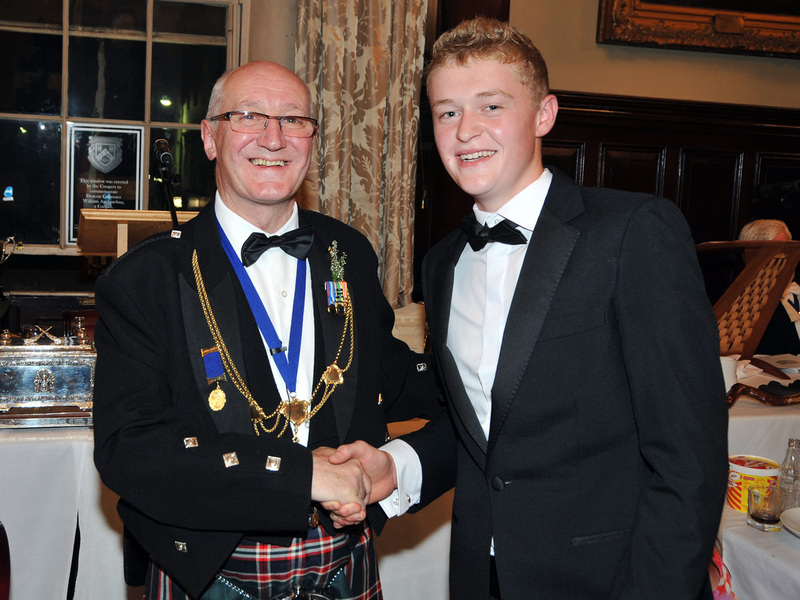 Jamie Acheson is from Largs and is in the fourth year of his Plasterwork apprenticeship with North Ayrshire Council. He completed his Advanced Craft programme in June 2014 to finish his studies at City of Glasgow College. During his time at College his record of achievement clearly represents the quality of individual he is. 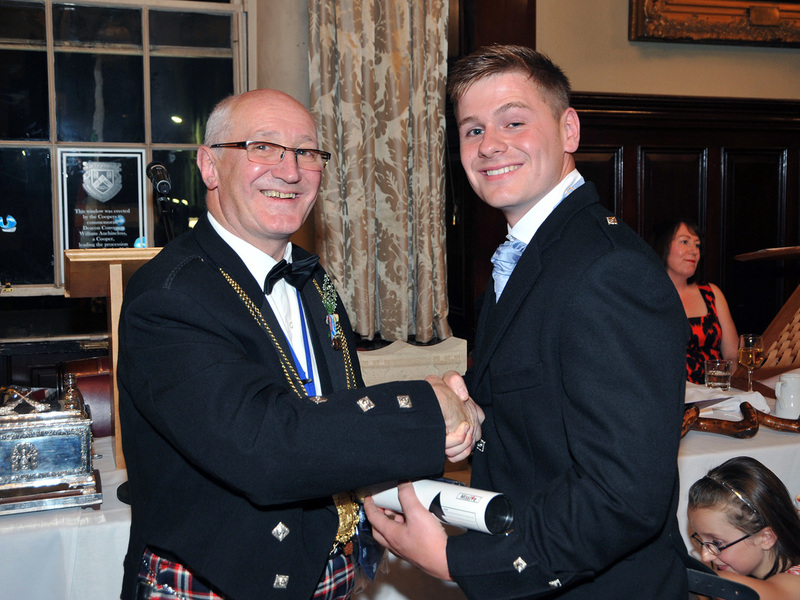 One of very few students ever to take the Apprentice of the Year prize in each of the three years he attended, while at the same time representing City of Glasgow College at Skillbuild Competition during his second and third year, producing exceptionally high quality work. His efforts were rewarded with a Second Place at this years’ event scoring highly enough to be invited to compete at the UK Finals at the Birmingham Skills Show later this year. Deacon Craig R Bryce and Joseph Ross winner of Plumbing Trophy. Joe Ross is a fourth year plumbing apprentice from Cruden Building Renewals. He has represented his College at the last two Skillbuild competitions where he performed to a very high standard against some of the most talented young plumbers in the UK. 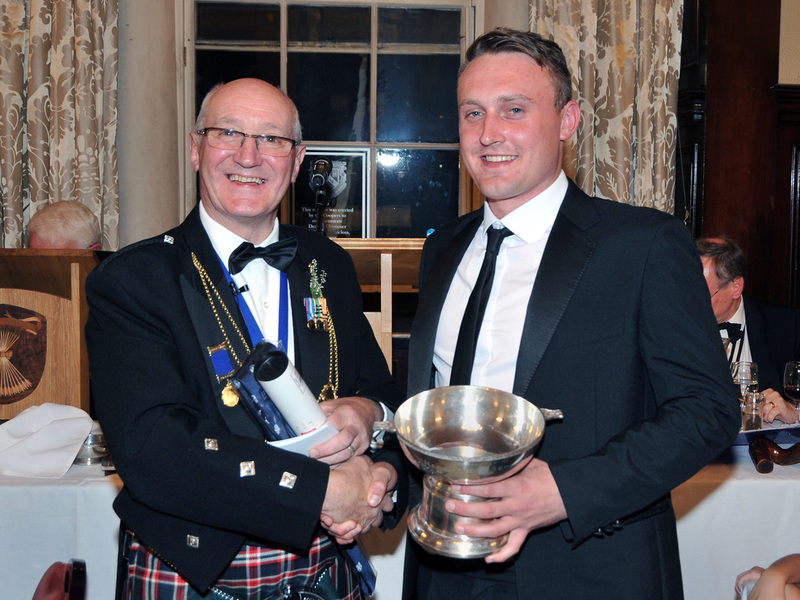 Joe has also been awarded with the plumbing apprentice of the year in 2013 and 2014. He has had an interesting journey to becoming a plumber that has seen him train and qualify as a lifeguard, a gardener and even a kayaker. It is clear however that Joe has found his true calling and as he looks to complete his apprenticeship and perhaps start his own business, the Incorporation wishes him the very best of luck. Deacon Craig R Bryce and Brian Johnston, Lady McDonald Award. Brian Johnson started his apprenticeship in October 2013 having been at the City of Glasgow College on an NPA course and impressing Campbell Stone on a work placement. Unfortunately for Brian his employment with Campbell stone did not work out and he was made redundant due to no fault of his. Brian’s commitment to continuing his apprenticeship was clear and after being supported by the Incorporation to continue his training whilst seeking employment, he gained employment with John Currie Stonemasons. Brian is an excellent example of a determined young man who has the skills and resilience to become an excellent tradesman. His college lecturer says that Brian is a credit to his company and thanks the Incorporation for giving a talented apprentice a second chance. Iain Smith; Brain Evans; Deacon Craig R Bryce; Doug Kerr and Gavin Smith. Winners of the Trades House Curling Trophy. This year the Merry Mason’s Curling team won the Curling Trophy for a second year in a row. The team consisted of: Skip Doug Kerr with Past Deacon Iain Smith at three, his brother Gavin at two and lead Late Deacon Brian Evans. A vote of thanks must also go to Coach Stuart. Well done and please come up and receive the trophy. 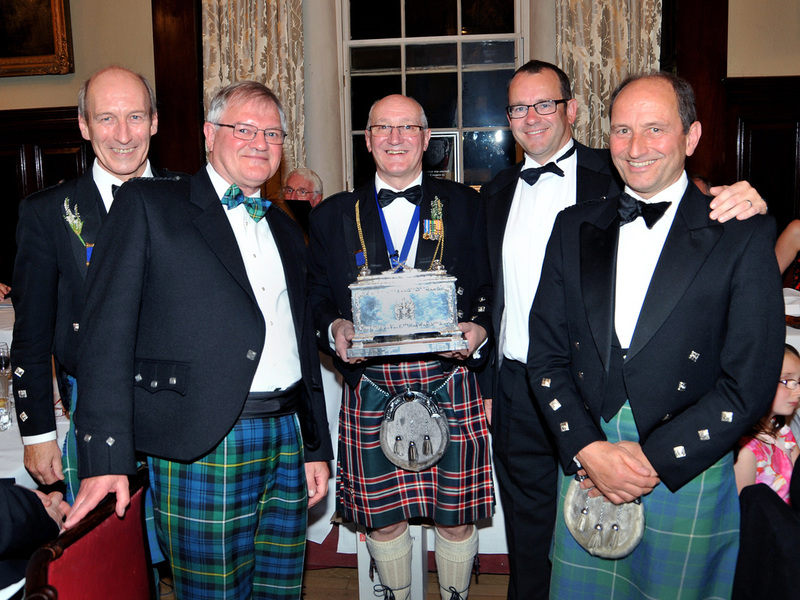 The Merry Masons Golf Team won the Golf Trophy. The Trophy is too large for them to take it away and none of the team could manage the dinner, they are possibly still celebrating their success. The first 5 prize winners were also made members of the Incorporation of Masons. Late Collector David Bannerman; Deacon of the Hammermen David Harrison; Collector of the Hammermen John McKnight and Late Deacon Brian Evans. During the evening there was a knock on the door and our official visitors, the Hammermen came and joined us. Deacon David Harrison and Collector John McKnight came in in the traditional manner and commented on the Masons very successful financial position and generous charitable giving. After this they gave gifts to Deacon Craig R Bryce and Collector David Bannerman. Both received a pin hammer and chisel and a bottle of malt whisky. Deacon Bryce gave the Deacon and Collector of the Hammerman a decorative glass Hammerman's crest made in his garden shed and a torch plus a bottle of malt whisky. Gill Connelly ~ Toast to the Trades House. 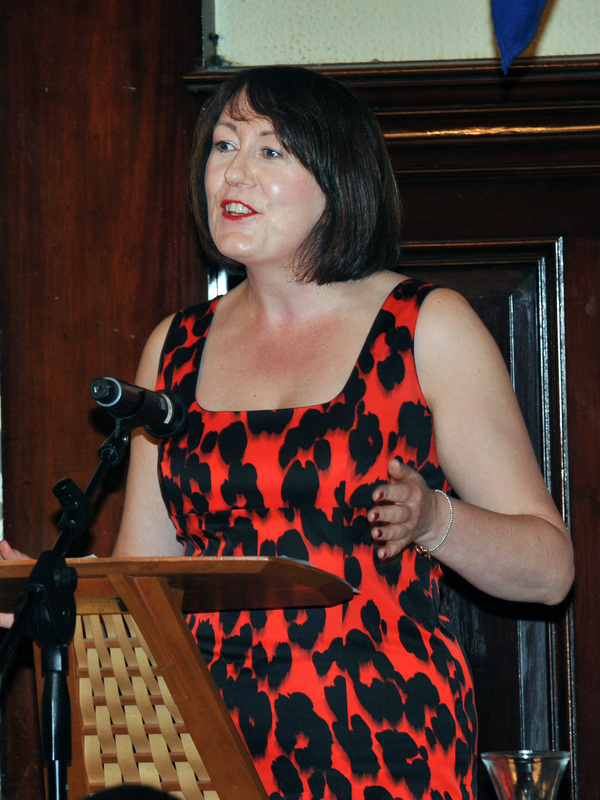 Gill Connelly gave a very interesting and moving toast to the Trades House of Glasgow. Gill described her work with Leuchie House which lost its financial support and in a very short time had to find new funding to continue to support sufferers and careers of people who had Motor Neuron disease and other conditions. Her toast emphasised the entrepreneurial approach and the spirit of can-do by the volunteers who successfully raised the funds, not only to save Leuchie House but also expand the vital work that they undertake. At the end of her toast, Gill led the diners in singing "The Auld Hoose". 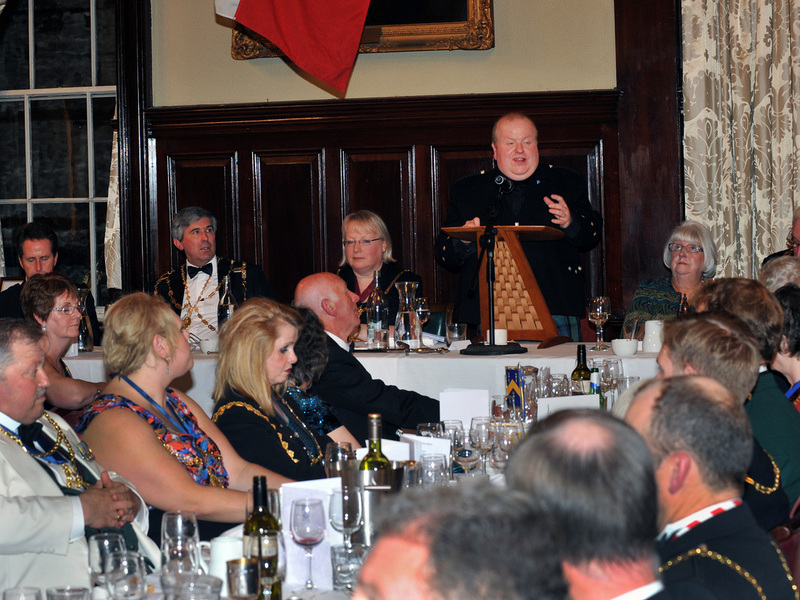 Deacon Convenor Hamish Brodie replying to the toast to the Trades House. 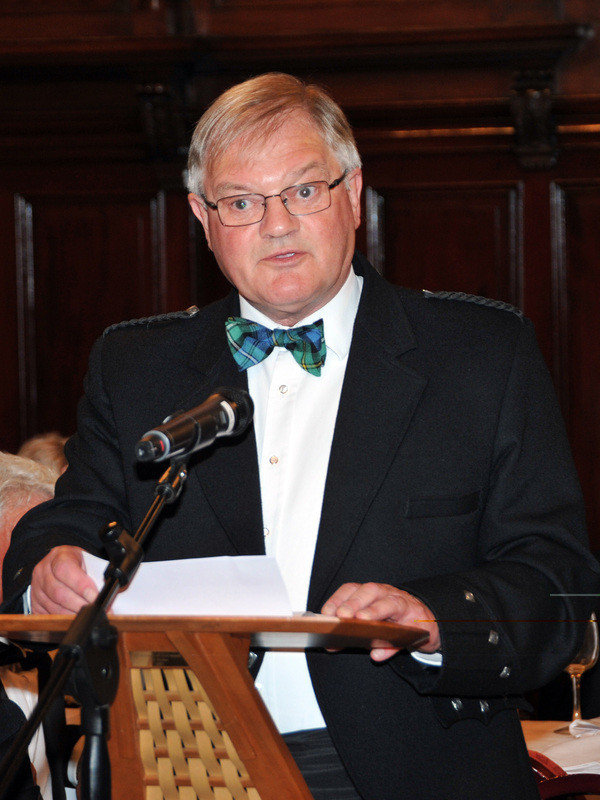 Deacon Convenor Hamish Brodie gave an excellent reply to Gill's toast in which he highlighted the work of the Masons for the House. He also informed the company of the work of the Trades House and its charitable giving. Hamish gave one of his now famous jokes which was appreciated by all. Deacon Craig R Bryce receiving the stone wine rack from Deacon of the Wrights John Walker. Suddenly there was a knock on the door and we were delighted to receive the visitation by the Deacon of the Wrights John Walker and his Collector Dorothy Newlands. As the dinner was running rather late, they were quickly welcomed in. 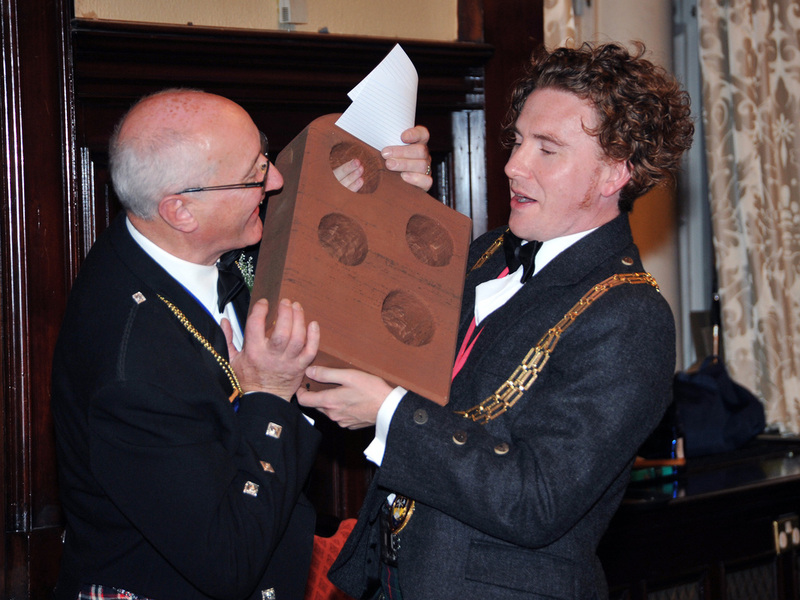 Deacon John Walker presented Deacon Craig R Bryce with a magnificent wine rack made from red sandstone which had come from a tennamental property in Glasgow. John had commissioned the stone and he and his wife Joanne had enlarged one of the holes for the bottles so that it would take a bottle of Irn Bru; Deacon Bryce's favourite tipple. Bottles of soft drinks were supplied to fill the other holes and Collector David Bannerman also received some lovely gifts. John also made a number of gracious comments concerning the Masons and the closeness that had developed between the crafts. Next it was Deacon Bryce's turn to compliment the Wrights and to present them with a few gifts. Deacon Bryce presented both the Deacon and his Collector with a Wrights Crest made from decorative glass. Deacon Bryce had made this in his garden shed as a mark of respect and friendship for a fine craft. Deacon John also received a torch to enable him to lead his craft to greater things and a bottle of malt to warm himself on cold winter evenings. On leaving John and Pauline gave a wonderful rendition of "Yes we will come back again". Late Deacon Brian Evans giving his 44th toast to Deacon Bryce. Late Deacon gave a very gracious toast to the Deacon and indicated that it was the forty fourth time that he had toasted the Deacon since he was a Collector. As time was short, David reduced his toast to enable everyone to get home at a respectable hour. Deacon Bryce thanked those who had made the evening a success and the evening ended with James Hamilton Smith "Rapping the Shed" and the singing of Auld Lang Sine. Many of the diners walked over to the Steps Bar for a wee libation prior to heading home after a very successful evening.